GAMES WERE REVOKED FROM MY ACCOUNT THE NEXT DAY. 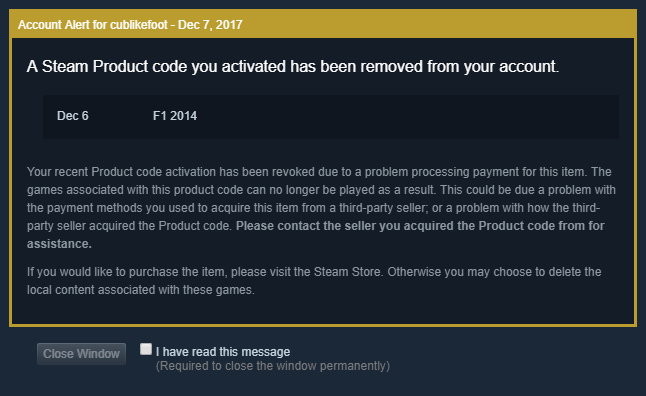 Both his games were Revoked from my Library due to "Payment Issue"
Game revoked hours later we traded. 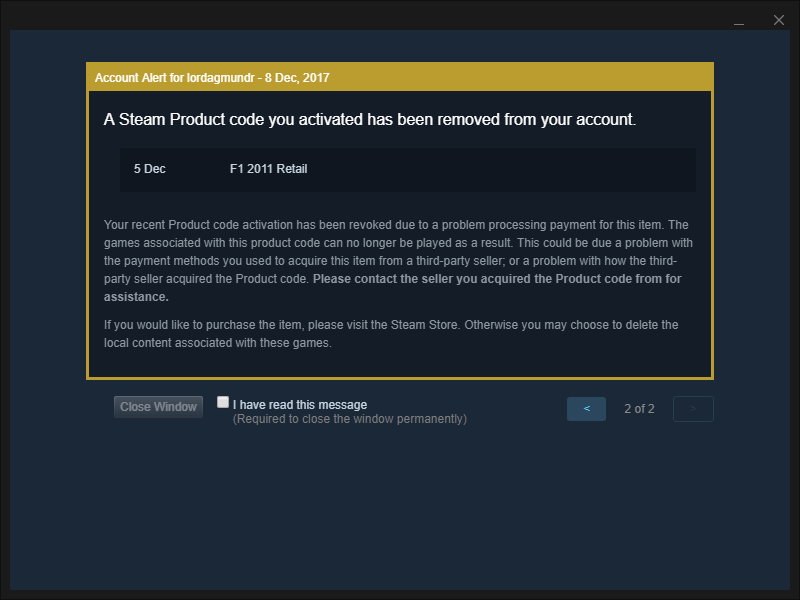 A message appeared as soon i enter steam hours ago saying that the game were paid with unknown or illegal means so they removed the game from my library. -rep THE GAME I TRADED WITH THIS GUY WAS REVOKED. DONT TRADE WITH HIM. -rep! game was revoked from account! Edit: My game didn't get revoked (yet), but seeing his other feedback I recommend being cautious. Keys got revoked after a few days. +rep Friendly, reliable and easy-going trader. EDIT: 3 weeks after our trade my game is still here. If anything changes I will update my review. Seeing other reviews my advice is - Proceed with caution! +Rep. Nice, fast and friendly trader! SCAMMER - traded 2 days ago, games REVOKED from library today. Chat message was "ok" and then REMOVED from friends and locked private profile. His avatar changed and name history has been "erased" with "...". Went by NIOH before. Sadly, I cannot pull friend list history, because he acted quickly to block all. +rep thanks for trade . EDIT- REVOKED KEY. SCAMMER ! Revoked games - Rust , F1-2015 , Dungeons of Endless . Great Trader. Trustworthy and friendly. Decent prices. Recommended. EDIT My game got removed from my account also. I'll see if I get my payment back. ultra fast and reliable. recommended. 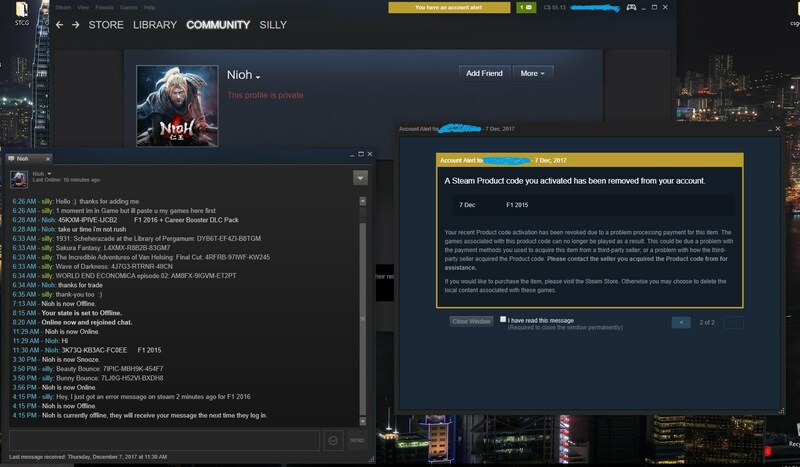 SCAMMER, traded 2 keys for darkest dungeon, it just got removed from steam. It will be my pleasure to remove my -rep when we resolve this situation. I do not mean to harm you. EDITED: ALREADY ARE 35 -REP IN LITTLE TIME FOR SURE HE DID THAT ALREADY PLANNED. MODERATION, PLEASE TAKE SOME ATTITUDE. SO BEGAN TO RECEIVE THE -REP, THE GUY ALREADY CHANGED HIS PROFILE TO PRIVATE. Stole my Homefront, Verdun & Umbrella Corps. -rep, keys got revoked afterwards. Also, he set his profile to private and deleted everyone he's traded with. Avoid and report on steamrep please.